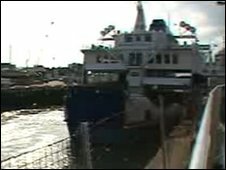 Two people were hurt when the Isle of Wight ferry hit the dock at Portsmouth. Passengers said vessel, called St Faith, hit the berth at Gunwharf Quays so hard that the bow doors could not be opened after the collision. A witness told the BBC the ferry had to make a 180 degree turn and unload vehicles from the stern. A spokesman for Wightlink said the vessel had been withdrawn from service as a precaution and delays were likely. Paramedics treated two passengers for minor injuries at the scene. Both were able to continue their journey.